Seeing the northern lights may be the quintessential bucket list experience. With the aurora appearing less frequently as we approach solar minimum (conditions that make it less likely for the northern lights to appear at low latitudes), it's worth paying extra attention when an opportunity to see the aurora arises. Those conditions will arrive the night of Saturday, May 5. The Space Weather Prediction Center (SWPC), a part of the National Oceanic and Atmospheric Administration (NOAA), put out a watch for a G1 geomagnetic storm -- a relatively minor geomagnetic storm -- because of a coronal hole that is likely to send increased solar winds toward Earth. That stream of solar wind should create conditions where the northern lights will be seen further south than usual. It may be seen by people in the northern reaches of the contiguous United States, particularly in Maine, Michigan, Minnesota, Montana, North Dakota, and Wisconsin. If you're lucky enough to be in one of these areas, there's another reason to get out and look up. We're in the midst of the Eta Aquarid meteor shower, which will peak the night of May 6. This G1 storm is projected to arrive a day before the peak, but there will still be meteors in the sky. The Eta Aquarids last from April 19 through mid-May. So, if you're out looking for the northern lights you might be treated to a buffet of meteors as well, particularly if you're out after midnight. Though, with a waning gibbous moon Saturday night, all but the brightest meteors could be washed out by the moonlight. 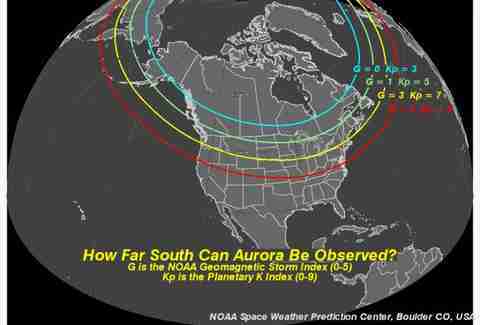 The light green line on the map above shows how far south the aurora might be seen on Saturday. Though, there is certainly no guarantee you'll see it there. To have the best experience, you'll need to get away from city lights, have clear skies in the forecast, and an unobstructed view of the northern horizon. Though the northern lights will be present, you aren't likely to see the brilliant well-defined ribbons you would see at northern latitudes like Alaska, Iceland, Norway, or Finland where the aurora is at its most spectacular. Before going out, it's worth checking the SWPC's 30-minute Aurora Forecast tool to see their projection of what time the aurora will be going full Pink Floyd Laser Light Show near you.